It is great to be able to mix my work outs up with such a wide variety of group exercise classes! 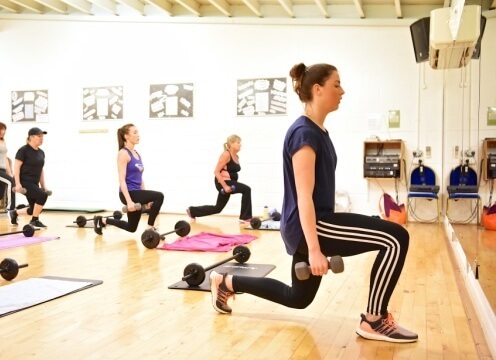 At Bexhill Leisure Centre we offer a varied programme of over 45 classes a week including Boxercise, Indoor cycling in our MyRide studio and Pilates. Ranging in time, they are perfect for those with busy schedules to pop-in and enjoy a class when it suits them. Best of all, classes are free to those with memberships or available on pay-as-you-go basis too. The full timetable can be viewed below. I love the freedom that Myride indoor cycling gives as I can't always make the instructor based sessions so Myride gives a lot more options! Myride is a unique virtual indoor cycling experience which allows you to cycle some of the most iconic route in the world. All rides include a virtual instructor who will work and guide you every pedal. Press play on the video to the right to see Myride in action. The full Myride timetable is shown below with over 75 classes to choose from. Come and experience Myride indoor cycling yourself at Bexhill Leisure Centre.